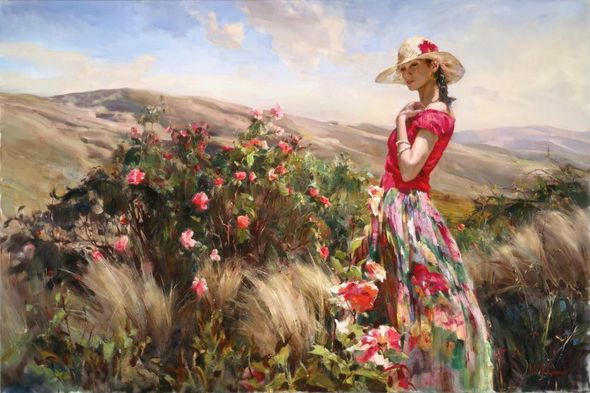 Michael & Inessa Garmash Hand Signed and Numbered Limited Edition Embellished Giclee on Canvas:"Local Color"
About the Artist: Michael and Inessa Garmash Michael Garmash was born in 1969 in Lugansk, Ukraine. He began painting at the age of three and by six started his formal education at the Lugansk Youth Creative Center. His works were sent by his teachers to a variety of Exhibitions in Ukraine, Russia, Czechoslovakia and Hungary. Michael received first prizes at several juried Exhibitions, including the Lugansk Regional Juried Exhibition-1977 (Best Poster), the Czechoslovakian International Youth Competition-1978, and the Hungarian International Art Competition of Circus Related Art-1978. In 1987, he graduated valedictor`m the Lugansk State Fine Art College and started teaching there the following year. From 1989 to 1991, he served in the army and in 1992 began studying at the St. Petersburg Academy of Art. Michael graduated from this prestigious school five years later at the head of his class. During his student years, Michael started exhibiting in France, at galleries in such cities as Paris, St. Etienne, Avignon, Lion and Marcel. Michael also took part in the annual Exhibitions in St. Petersburg, Russia. In addition to painting, Michael has also excelled in the creation of stained-glass windows and received an honorary medal for his work in the Suvorov Military Museum in St. Petersburg. Inessa Kitaichik was born in 1972 in Lipetsk, Russia. Since early childhood she has excelled in ballet, gymnastics and music. Inessa attended classes in all three disciplines and, after graduating from music and ballet school, entered the Lugansk Fine Art School at age fifteen. At seventeen she was accepted as that year's best undergraduate to the Lugansk State Fine Art School. AN ART LOVE STORY During his stint in the army, Michael returned to his former school on a two-week vacation. The last day of his visit he met Inessa at a bus station; the next day Michael didn't return to his division. Inessa woke that day to her image painted all around the city surrounding her house-on the road, on the walls of buildings and the walls of her apartment staircase. Michael had spent the night painting; he was arrested first by the city police, then handed over to the army MP's, but he was not punished. (Even military personnel can sympathize with true love!) One year later, Michael and Inessa returned to the same bus station. Michael hung a bouquet of flowers on the station sign to commemorate the place where they met; the beginning of their "at-first-glance" love story. In similar spontaneous fashion, the two began painting together. Several years after their marriage, Michael began a painting of their daughter for a project at school. However, their two-year old found the painting during his absence and painted her own version of the subject. Inessa, not wanting Michael to be upset, fixed the painting, packed it up and gave it to him to submit. Michael handed the painting over for review and was told it was his best work ever. He was surprised to see the "new" painting and immediately recognized his wife's hand. Since then, Michael and Inessa have worked together creating paintings, stained-glass windows, mosaics and drawings. They have exhibited in Sweden, France, Russia, Ukraine, Belgium and Finland. They continue working with their daughter Polina as a model and occasionally include themselves in their compositions.